The subtalar joint is an articulation between two of the tarsal bones in the foot – the talus and calcaneus. The joint is classed structurally as a synovial joint, and functionally as a plane synovial joint. This article will look at the anatomy of the subtalar joint – its articulating surfaces, movements and neurovascular supply. Inferior surface of the body of the talus – the posterior talar articular surface. Superior surface of the calcaneus – the posterior calcaneal articular facet. As is typical for a synovial joint, these surfaces are covered by articular cartilage. Note: Some texts will refer to the talocalcaneal part of the talocalcaneonavicular joint as being part of the subtalar joint. Although this forms part of the functional joint, the true anatomical subtalar joint consists only of the surfaces mentioned above. Fig 1 – The subtalar joint and interosseous talocalcaneal ligament. An additional ligament – the interosseous talocalcaneal ligament – acts to bind the talus and calcaneus together. It lies within the sinus tarsi (a small cavity between the talus and calcaneus), and is particularly strong; providing the majority of the ligamentous stability to the joint. The subtalar joint is formed on an oblique axis and is therefore the chief site within the foot for generation of eversion and inversion movements. This movement is produced by the muscles of the lateral compartment of the leg. and tibialis anterior muscle respectively. The nature of the articulating surface means that the subtalar joint has no role in plantar or dorsiflexion of the foot. The subtalar joint receives supply from two arteries and two nerves. Arterial supply comes from the posterior tibial and fibular arteries. Innervation to the plantar aspect of the joint is supplied by the medial or lateral plantar nerve, whereas the dorsal aspect of the joint is supplied by the deep fibular nerve. The calcaneus is often fractured in a ‘crush‘ type injury. 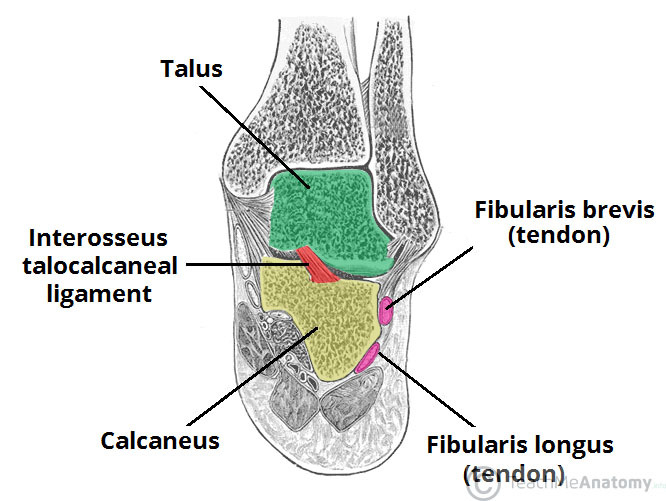 The most common mechanism of damage is falling onto the heel from a height – the talus is driven into the calcaneus. The bone can break into several pieces, known as a comminuted fracture. Upon x-ray imaging, the calcaneus will appear shorter and wider. A calcaneal fracture can cause chronic problems, even after treatment. The subtalar joint is usually disrupted, causing the joint to become arthritic. The patient will experience pain upon inversion and eversion – which can make walking on uneven ground particularly painful. 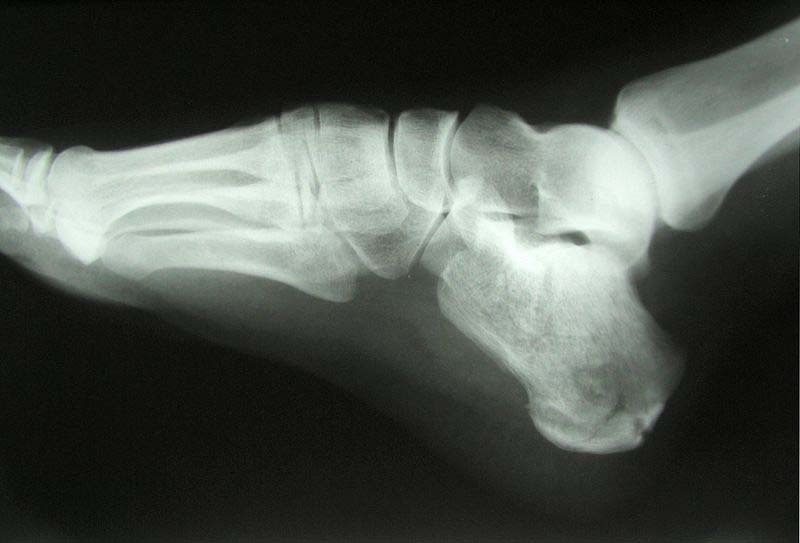 Fig 2 – X-ray of a calcaneal fracture. What two tarsal bones contribute articular surfaces to the anatomical subtalar joint? Which movement is possible at the subtalar joint? Which ligament is the chief stabiliser of the subtalar joint?